Paul earns $3 for each tickets that he sold. He earns extra $8 for every 15 tickets sold. How many tickets must he sell in order to earn $212? Step 1: Draw 1 box to represent $3 earned for each ticket sold. 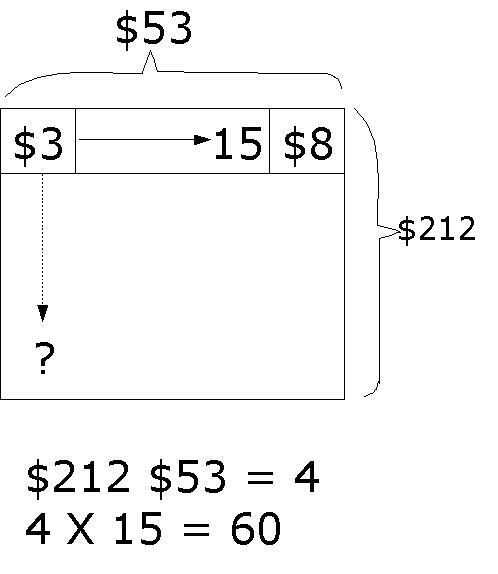 Draw the multiplication model to show 15 X $3. Add 1 box behind to show an additional $8 earned for 15 tickets sold. 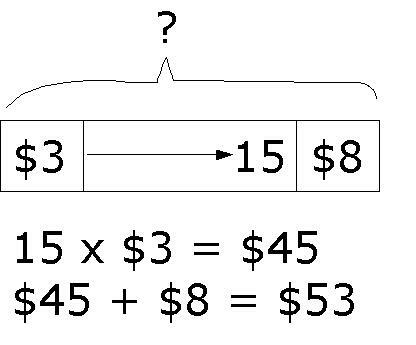 Find the total value of this whole bar. Thus, for every 15 tickets sold, Paul will earn $53. Step 2: Draw a dotted arrow pointing downwards to show that this bar may be repeated many times till we get a total of $212 (indicated by the value on the right). Step 3: Divide the total amount earned ($212) by the amount earned for every 15 tickets ($53) to get 4 sets of $53. As every set has 15 tickets, we multiply 4 by 15 to get the total of 60 tickets. Thus, Paul must sell 60 tickets to earn $212.